It has been a little while since I did a "save vs. splurge" post. I cannot get over how similar each of the pieces are! That leopard sweatshirt is only $18 and the mules are, too. And, if you are not sure how much you would wear pink mules - I shared another way to style them here. Also, a few of the "splurge" pieces are a good deal, as well. I picked up this $20 spring sweater. This $18 sleeveless blouse - is great layer under a blazer or worn on its own. I bought this $20 sweater - and am really impressed with the quality. This classic shirt is only $20 - and comes in five colors. I love a cozy sweatshirt like this one. I like this sweatshirt - with the sleek side slits. I like this “window-pane” blazer. This water resistant quilted jacket is 40% off - and reminds me of the Burberry one. This cropped trench would be a fun update on the regular trench coat. This new disc chandelier earrings would look great dressed up! They brought back one of my favorite blouses. This cute striped sweater is an extra 60% off. My favorite product that is the best for chapped lips is 15% off. What a fun combination! Those pink mules are the cutest! Thanks! Those pink mules have me thinking I need a pair of pink pumps. I think your save vs. splurge posts are my favorite! Thanks for doing the leg work to find good deals for us! 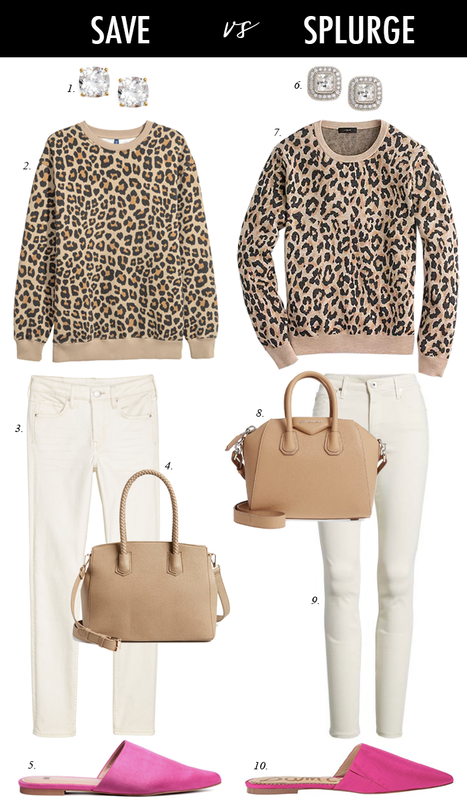 Love the leopard sweater from H & M! What a great find. This outfit is such a great combo of color and print! Those pink mules are perfection. I love the leopard sweatshirt, too! Thanks so much! I am going to try to work them in to a weekly series. Such a great combo and I would not have thought to pair the pink flats with it! Cute! I loved this post! Leopard and pink are my love language and such great deals!! That under $20 leopard sweater is such a good find!! Thanks for sharing!